This is the same Contacts that are on your iPhone and iPad, assuming you use iCloud to sync the information with your Mac. Most apps just use Contacts for your own information, for things like auto-fill and auto-completion where it’s handy to automatically place name, email, and phone numbers into forms. 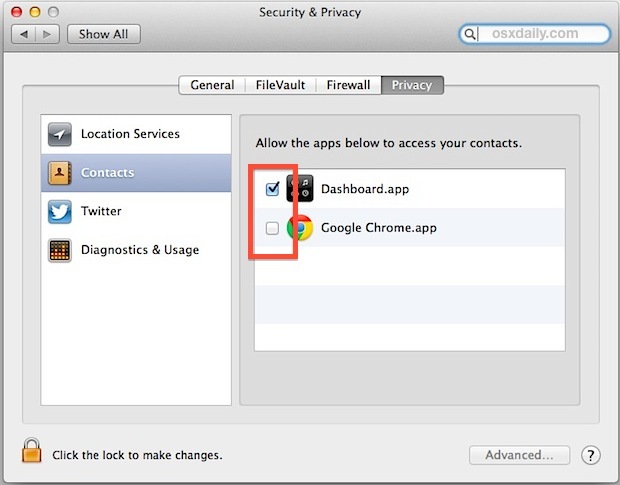 This is an added security feature that arrived with recent versions of OS X and between GateKeeper and this you shouldn’t have to worry much about any nefarious apps accessing or abusing personal data. Dashboard is so 2003. Bloatware, memory hogger, distracter, toy-app. Time to get rid of that dated part of OS X. No, I use Dashboard many times a day. It’s the easiest way to store frequently used monitoring tools, status outputs and achieve basic information retrieval without disturbing your working session. It’s superior to the method used by other operating systems which place these mechanisms on a background layer, underneath all windows. What would you suggest replacing all of that with?